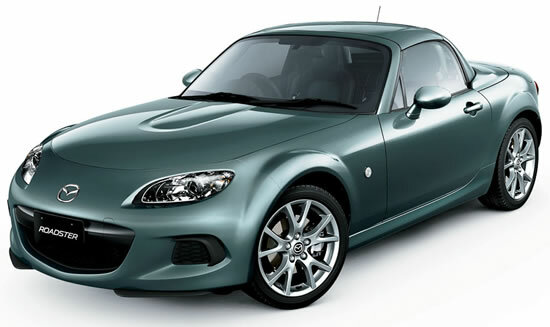 Mazda has upgraded the Mazda Roadster (known overseas as the Mazda MX-5) for the Japanese market. The refreshed two-seater open-top sports car goes on sale today at all Mazda and Mazda Anfini dealerships throughout Japan. The design of the upgraded Roadster distinguishes between the sporty character of the soft top and the refined character of the power retractable hard top (RHT) through the use of coordinated black and silver features respectively. The front face of both versions has been redesigned to present a more aggressive look. For the interior, a new luxury tan color is available for the genuine leather seats. In addition, revised characteristics of the throttle and brake booster (power braking device) have improved control of the accelerator in the manual transmission models and the brakes in all models. The enhancements add polish to the pure driving pleasure which has made the Roadster (MX-5) famous. In addition, the updated Roadster features an Active Bonnet (pedestrian protection system). At certain vehicle speeds, when sensors detect an impact exceeding a defined level, the rear end of the bonnet is raised. This creates a space between the bonnet and the engine which acts to absorb the energy of impact and reduces the severity of head injuries in collisions involving pedestrians.